Leftist can be easy to spot, and this story is about a Leftist. She left her dog in the car on a hot day, and an ex-Army veteran decided to help the poor animal. For his good deed, he got arrested. 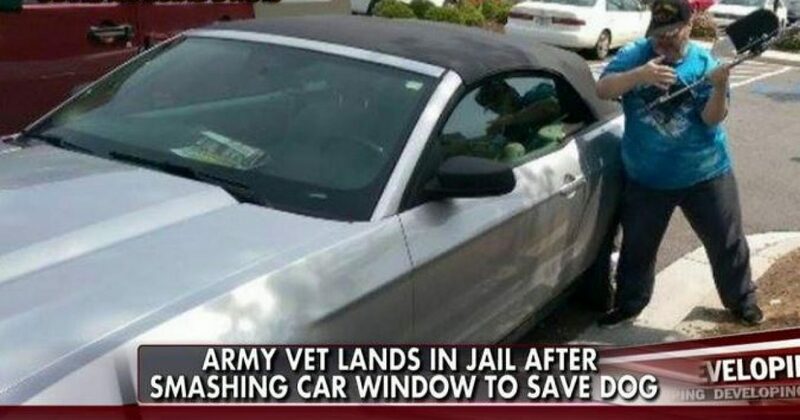 A Georgia Army veteran who saved a dog from a hot car has been arrested for smashing a window to free the animal. Trace Gallagher reported on “The Real Story” that Michael Hammons of Athens was charged with criminal trespassing after freeing a small Pomeranian mix from a vehicle parked outside a shopping mall. Gallagher said that several shoppers noticed the dog in distress and called the authorities. Hammons wasn’t waiting for police to arrive, so he grabbed the footrest of his wife’s wheelchair and smashed the window. And the woman was mad that he had broken her window. I get it, as my car windows have been smashed four times by local miscreants stealing my meter money. But I would be ok with somebody smashing my window, if I were negligent enough to leave my dog ROASTING IN THE SUN! Apparently this veteran should have just let the dog die, and take pictures of it as evidence against the owner; the irony being that the owner would have gone to jail. Gallagher noted that beginning in July, Georgia law does allow one to break a window to save a child in distress, but not animals.